Haren – Gone are the days when antistatic sliding materials were only ever black. With LubX® CV AST color and LubX® AST color, Röchling Engineering Plastics SE & Co. KG, Haren/Germany, is now the first manufacturer in the market to offer permanently antistatic sliding materials in a variety of colours. Previously, permanently antistatic sliding materials could only be obtained in black due to the modification with carbon black. Röchling now offers LubX® materials in white (RAL 9003), green (RAL 6016) and blue (RAL 5013). This innovation gives customers new options for the construction of safe and economic conveyor systems, particularly for sensitive goods. The controlled dissipation of electrostatic charges is increasingly important in conveying technology. To prevent possible damage to sensitive goods and to people, conveyor systems for such goods have to be constructed with materials that dissipate high static charges in a controlled manner. However, the use of an antistatic material often results in a decrease of the slide properties and hence the cost-effectiveness of the system. Röchling had already focused on this problem back at the start of 2016, giving the proven sliding material LubX® antistatic properties and launching it on the market as LubX® AST black. In response to enormous demand from customers involved in conveying sensitive goods, Röchling has now also developed LubX® CV AST color and LubX® AST color. That makes Röchling the first manufacturer in the market to offer permanently antistatic coloured sliding materials that do not contain carbon black. 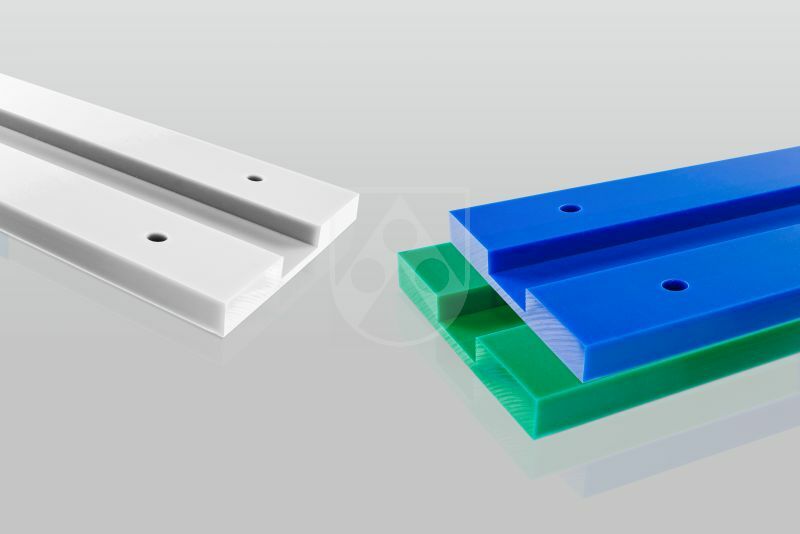 Designers can obtain both materials in white RAL 9003, green RAL 6016 and blue RAL 5013. Customer-specific colours can also be produced, however. LubX® CV AST color and LubX® AST color are suitable for systems in which a high degree of purity alongside an antistatic effect is required. In these applications it is essential to preclude the abrasion of carbon black, which could contaminate the products under certain circumstances. Examples include transport systems for pharmaceutical products, conveyor systems for electronic components and conveyors in the food industry. In these areas there is a need for the fast and safe conveyance of goods while meeting the highest requirements on purity and quality. The new colour options also open up new design possibilities in terms of appearance, though. LubX® CV AST color combines outstanding slide properties (coefficient of sliding friction µ: 0.13) with antistatic properties and is particularly suitable for conveyor systems that are to be operated at higher velocities to deliver greater productivity. LubX® CV AST color generates very little heat. Both results in lower wear and a longer lifespan of the entire system. LubX® AST color is characterised by a very good sliding action (coefficient of sliding friction µ: 0.19) and offers an improvement in slide properties of more than 30 per cent compared with standard materials for mechanical engineering. This reduces the energy required for conveyor systems whilst simultaneously affording high process reliability. The tests were carried out in the company's own materials lab on a tribology test apparatus developed in cooperation with scientists. Customers can obtain the new materials LubX® CV AST color and LubX® AST color in the form of extruded profiles, as sheets in dimensions up to 6,000 x 2,500 mm and as machined components based on customer drawings.